← Decades Blogathon – Still Time To Be Part Of Something Great! 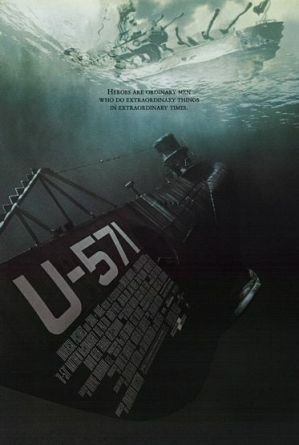 Brief Synopsis – During WWII, an American submarine crew is sent on a dangerous mission to retrieve the German code machine from a stranded German U-Boat. My Take on it – This is a film that I saw in the theater when it came out and didn’t really have any urge to watch it again because it never left such a great impression on me. I decided to watch it again in hopes that my memory was wrong and perhaps there truly is a hidden gem here. This film has very little going for it. The cast is quite good and I actually expected that fact to help it along yet the story and plot are so weak that not even great actors like Matthew McConaughey, Harvey Keitel or Bill Paxton could turn things around. In the end, the actors are all wasted because the story is so boring and lackluster. They try to accomplish too much here and invariably make so many aspects of the story completely irrelevant. There are also so many plot holes here that no ship could stay afloat with so many holes in it. This makes things even more confusing because characters seem to appear and disappear at will without any kind of explanation which can be quite annoying. Many of the battle scenes take place at night and it would be the same whether you keep your eyes opened or closed during these fights because it is quite difficult to actually understand what is going on. I would have thought that the cinematography would be done in a way where we actually can follow the story much better. Bottom Line – Great cast is wasted by a mediocre script that is weakened by a lackluster plot. They try to accomplish too much at once which ends up rendering most of what happens completely irrelevant. Too many blatant plot holes make this even more confusing than it probably should gave been. I agree with your take. Beyond it being a lackluster movie, historically the film is a mess. It’s loosely based on a real incident, but the submarine and crew that went after the code machine were British, not American–it happened before the US joined the war. The decision to Americanize the heroes basically destroyed the movie. Our naval presence in the Atlantic during WWII was pretty slim; we needed most of our assets in the Pacific against the Japanese. The German codes were broken before we got into the war. The command structure, as they show in the film, makes no sense. And disguising an Allied boat as a German one would be like painting a rising sun on a B-29 and flying it over Japan trying to convince people it’s a Japanese plane. Terrible and deeply stupid film.